A few years ago I was lucky enough travel in Tuscany with my mother. It was our first trip together and our first ever traveling with a tour group. We had a wonderful trip, stayed in Sienna and visited a number of the hill towns in the area. The hotel had a very good kitchen, so good that we ate there almost every night! One night they served us a cup of tomato soup for our starter. It was thick but not heavy, and like no other tomato soup I’d ever had. I asked one of our tour guides if she could give me the recipe. She looked askance at this request, shook her head and informed me that she was from Umbria. Mind you, that’s all of 10 miles down the road. Gives on a whole new slant on “local”, for certain! The menu called it “pappa al pomodoro”. Apparently “pappa” translates as baby food or “pap”. It may sound less than appetizing, but I’ve found salads and soups in France, Spain, and Italy that incorporate yesterday’s bread and I am a fan. Remember this no-cook soup? This is almost as simple. Actually, I hadn’t planned on making soup just now. I was inspired by a gift. A friend brought me a bag of croutons from a French bakery here in town. They were beautiful, scented with herbes de Provence and lavender, and I enjoyed some on salads but I got to thinking about this soup. This is one of those “un-recipe” recipes. I’ll tell you what I did as best I can, but you’ll have to play with it to get it the way you want. You can add herbs, fresh or dried, you can top it with cheese with you serve it; you could even serve it in a bread bowl, I suppose. Have fun! 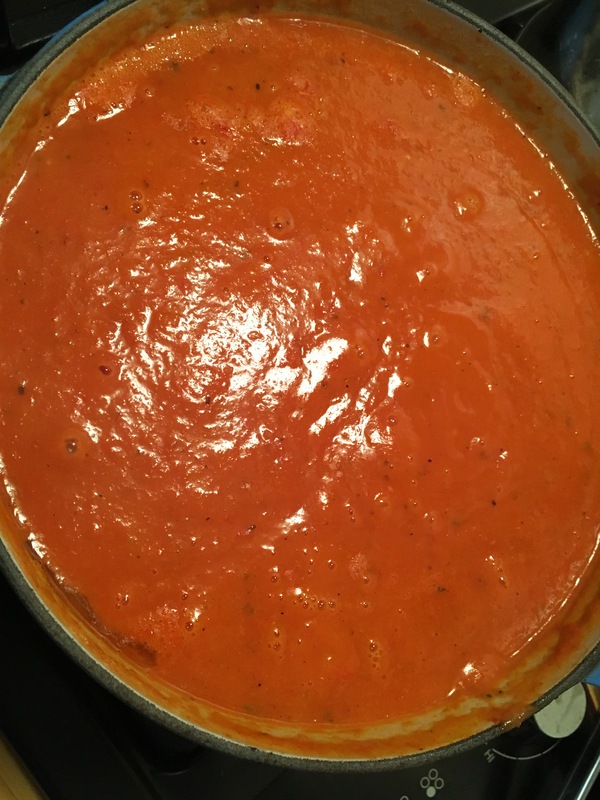 Here’s my cheater’s version of all-too-easy tomato bread soup. Enjoy! In a heavy soup pot, sautee the onion in the olive oil until the onion is translucent. 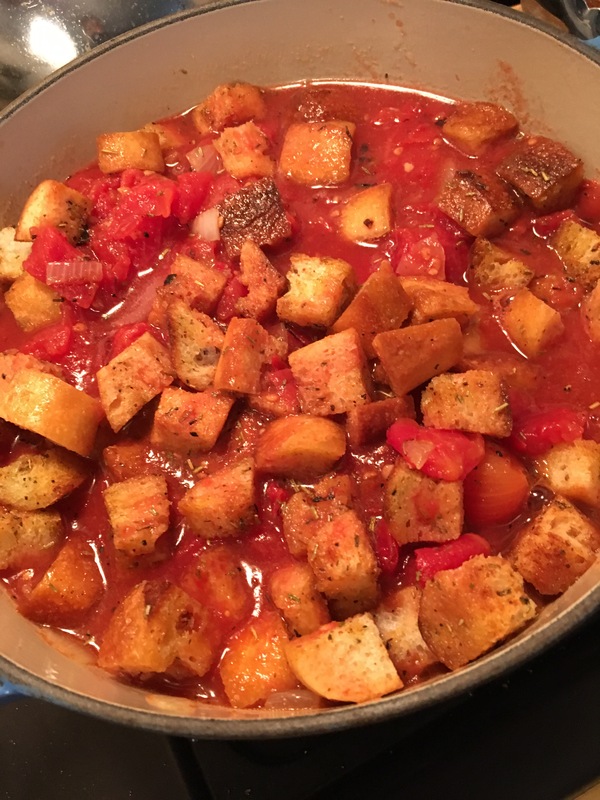 (**I added some fresh chopped rosemary and some fennel seed) Add the canned tomatoes, about 1 cup of vegetable broth and the bread. Simmer for an hour, covered, then puree with a stick blender (or in a blender but, of course, be careful!!). Add more broth if you think it is too thick, add more bread if you think it is too thin. If you grow your own tomatoes then make this in the summer with your harvest! I’ll stick with buying good canned product and make this year-round! Enjoy! Yum that looks good! Can almost taste it.